Digital Design / Re: Natascha’s Technique for Digitizing Calligraphy! Thanks for sharing it, Erica it was my pleasure! I got really annoyed by people asking for sooooo much money for photoshop actions when it's actually so easy. 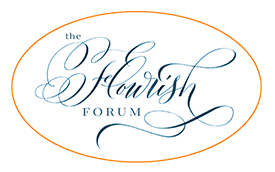 Open Flourish | General Discussion / Re: Kurrentschrift--Want some? Completed/Past Exchanges / Re: Holiday Exchange 2017 Lists have been sent! I think I got all of your cards, thank you so much! I love the picture with the different colors! Pay a printer who specialises in this sort of thing? I've spoken to several people on the list with various birthdays and it seems like the exchange is pretty much dead. New people sign up regularly and there's over 100 people signed up but people aren't sending anything anymore. I love this book. I actually did a fair amount of research on the calligrapher and it appears that he was active in Vienna, where I now live. His other book rests in a vault here and is inaccessible to the public but you can acquire a digital copy for a mere 260€ ... gulp. @Steve_H Okay, then let me rephrase: Is the instruction in the online videos good? Completed/Past Exchanges / Re: Improbable Items Exchange Lists have been sent! Soooooo ... since I didn't participate, please share the items and which ones made it! Any more info on the DVD? I'd like to give Italic a better go but the previews look so esoteric. Is the instruction good?